Levi Nakea to Abbie Nakea, March 22. To David Nakea and Annie Kawainui, a son, March 15. To Antone B. Cruz and Emalia Napai, a son, March 21. To John Helekahi and Kahuakainui, a son, March 22. To H. Aomi and Maialoha, a daughter, March 22. To John K. Panai and Mary Kaainoa, a son, March 23. To Joseph M. K. Kapaona and Rosalia Kapaona, a daughter, March 23. Nicholas Kawaauhau on Liliha Street, March 19. H. Paalua, on Emma Street, March 19. Mary Hilo, on Luso Street, March 21. John A. Cummins, on Alexand Street, March 21. Ema Kamokunui, on the corner of Winam and Mooheau Streets, March 22. Lahela Moke, on Bishop Lane, March 22. Maryann Makalipo, at the Insane Asylum, March 22. Ka Nupepa Kuokoa, Buke LI, Helu 12, Aoao 8. Maraki 28, 1913. Deaths in Kalawao (continued), 1885–1886. THE DEATHS IN THE COLONY OF KALAWAO DURING THE YEAR OF 1885 AND THE YEAR 1886 WHICH IS GOING ON NOW. DEATHS IN 1885 A. D.
2 Paulo Kaluna m, Hamakua, H.
” Kaiweo m, Honolulu, Oahu. ” Elena Makaike f, Honolulu, O. 9 Samu’l Kaukau m, Waimea, K.
25 S. P. Kahelenaue f, Wailuku, M.
Ko Hawaii Pae Aina, Buke IX, Helu 41, Aoao 4. Okatoba 9, 1886. This past July, I sent to the newspaper Elele, the Name List of the leprosy patients who died in this Colony; however, the Elele didn’t publish the names of those who died as per what I sent them. Why would that be? Could it be the editor of the Elele is not interested in publishing the names of those who left hardships of this life? Does the Editor of the Elele think that putting before the public the names of those who departed this life is something trivial? DEATHS IN THE YEAR 1885 A. D.
4 Kahaolekuewa m. Kawaihae, H.
15 Mele Kapohaku f. Honolulu, O. 10 John Nakanaela m. Waialua, O.
Ko Hawaii Pae Aina, Buke IX, Helu 38, Aoao 4. Sepatemaba 18, 1886. Even more deaths from Kalawao, 1887. 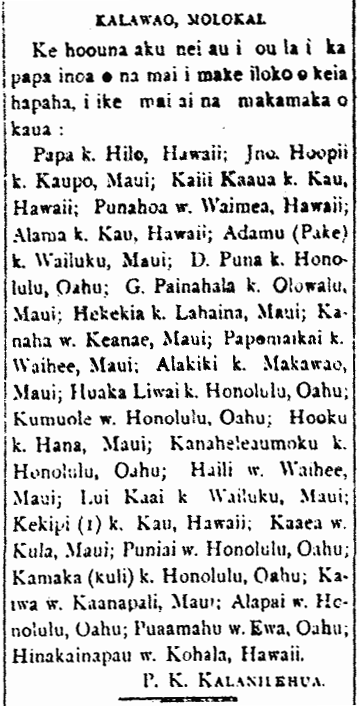 Deaths in the Colony of Kalawao for the first Quarter of the year 1887 A. D.
To the Kuokoa; Salutations to your patience. Here again is a sad delivery to be loaded upon your shoulders so that our friends from Hilo Hanakahi all the way until the pleasant base of Lehua [the whole archipelago] may see. There were 21 who died this quarter, and the number of remaining leprosy patients here in the Colony is 541; from within this number, 356 are male, and 185 are female; and 48 are in the Hospital of which 38 are male and 10 female. This is my report with humility. Secretary, Kalawao, July 16, 1887. ¹ This line is folded under and can’t be seen clearly. There are many pages of newspaper images like this, and this is just another reason that the newspapers have to be unbound and flattened out so that they can be shot clearly. Ka Nupepa Kuokoa, Buke XXVI, Helu 30, Aoao 4. Iulai 23, 1887. 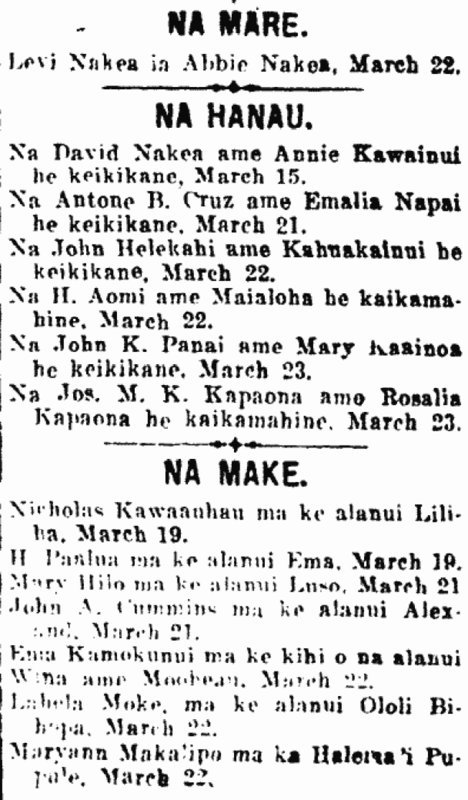 More deaths in Kalawao, 1887. The deaths in the Colony of Kalawao in the first Quarter of the year 1887 A. D.
To the Kuokoa Newspaper; Aloha oe:—Please put in one of your columns the names of those who died in this colony, so that our friends living in the neighborhoods of our archipelago may see. The numbers of us known on the 28th of December of the past year 1886 A. D. were 588 total; of this, 398 were males and 190 were females. And the total deaths in this Colony during that year were shown before the public in the Newspaper Pae Aina [Ko Hawaii Pae Aina]. And here below is the list of people who died in the first three months of 1887 A. D.
” ” Lephen Kiwaa (m) Honuaula, Maui. There were 37 deaths in this quarter, and the number of us remaining are 552; that being 365 males and 187 females. Ka Nupepa Kuokoa, Buke XXVI, Helu 20, Aoao 3. Mei 14, 1887. Patients at Kalawao who passed on. 1887. Papa (m.) Hilo, Hawaii; John Hoopii (m.) Kaupo, Maui; Kaiii Kaaua (m.) Kau, Hawaii; Punahoa (f.) Waimea, Hawaii; Alama (m.) Kau, Hawaii; Adamu (Chinese m.) Wailuku, Maui; D. Puna (m.) Honolulu, Oahu; G. Painahala (m.) Olowalu, Maui; Hekekia (m.) Lahaina, Maui; Kanaha (f.) Keanae, Maui; Papomaikai (m.) Waihee, Maui; Alakiki (m.) Makawao, Maui; Huaka Liwai (m.) Honolulu, Oahu; Kumuole (f.) Honolulu, Oahu; Hooku (m.) Hana, Maui; Kanaheleaumoku (m.) Honolulu, Oahu; Haili (f.) Waihee, Maui; Lui Kaai (m.) Wailuku, Maui; Kekipi 1 (m.) Kau, Hawaii; Kaaea (f.) Kula, Maui; Puniai (f.) Honolulu, Oahu; Kamaka (deaf m.) Honolulu, Oahu; Kaiwa (f.) Kaanapali, Maui; Alapai (f.) Honolulu, Oahu; Puaamahu (f.) Ewa, Oahu; Hinakainapau (f.) Kohala, Hawaii. Hei, cat’s cradle, Hawaiian style, 1916. There are many people studying the history of Hawaii nei and the lifestyle of its people, like what has been done with America, Europe and Asia. And through this studying of history, there has not been a lack of new information which brings benefits by its study. However Judge [Lyle Alexander] Dickey has come up with a new path to this study, not utilized before in Hawaii nei. He is learning string figures, and is collecting the old names and the mele that go with these string figures. He now has about a hundred or more of them. String figures is something done all over the world. And most people know one or two. From what is known, there is not much of them in Europe and Asia; there are a bit more in Africa; and there is a lot with the Indians of America and the people of the islands of the Pacific. There are two books on string figures of the islands of Britain, the Indians of the Arctic, the Indians, and a few from the islands to the south of us. There is nothing written on the hei of Hawaii nei, even if Hawaii’s figures are most wonderful for the mele which accompany them. Some are not difficult, however some are very problematic because of the many transformations, with different lines of mele going along with each change. Some are very humorous without value, while some are for wooing, while others are riddles. Knowing the way of life of the people, its tales, its history, and the lay of its lands—this is the means of understanding the meanings and kaona (underlying meanings) of these hei. Perhaps the most widely memorized figure is called Hale Kumukaaha. However to this day, Judge Dickey has not gained clarity as to the true meaning and kaona of this hei. Some figures done by the school children of Hawaii are perhaps not originating in Hawaii nei. The hei called “six eyes” is probably not from here [the first image]. Not a single old Hawaiian can make this figure. Maybe it is a new figure or maybe one from outside of Hawaii. Some of the hei are associated with daily life, like the canoe, the net, the hammock, the imu, and the water gourd. Some are associated with animals and fish, like the turtle, the mo’o, the manini, the aweoweo, the hapuu, and the bird. Some hei are associated with the house like the kumukaaha structure, the loulu structure, and the paakai structure. There are a very little hei pertaining to body parts, like the piko of Kahoalii and the breasts of Ne. There are many dealing with land and famous fishing shrines as well as men with god-like bodies. Kauiki, for probably a good reason is the most widely known figure. One hei is for Wailua and it is seen in the attached illustration. A majority of the people who have the song or chant memorized along with the figures, have died without teaching them to their children. There are so many other things that entertain the new generation, but this entertainment of times long ago is something that the Hawaiian people are proud of. This skill shows intelligence in making the figures and associating it to this thing or that, and it is important that this ancient knowledge be kept. It would be good if someone reading this knows of some old Hawaiian who has a chant or mele memorized close at hand, one who is fond of mele and versed in string figures, or one who knows string figures, that he should Judge Dickey in Lihue, Kauai and tell him of what this person knows. There are many different hei of which the judge has heard, however, he has not found someone now living who can show them to him. There is one that is associated with the net of Makalii that J. S. Emerson saw in Hawaii many years ago; there are also some associated with the story of Pele and Kamapuaa, the paddle o Maui, “haehae ka manu e Kanealoha,” and so forth. These are great and very valuable, and it is important that they be preserved without regard to its simplicity or difficulty. And it is perhaps something that will bring joy when witnessing it being done, or perhaps something exceedingly appalling to consider. Ka Nupepa Kuokoa, Buke LIV, Helu 23, Aoao 3. Iune 9, 1913.